Race City had been in decline for several years. During it's final year, the stands were rickety and breaking, paint everywhere was faded and peeling and the drag strip was hardly level or smooth from end to end. 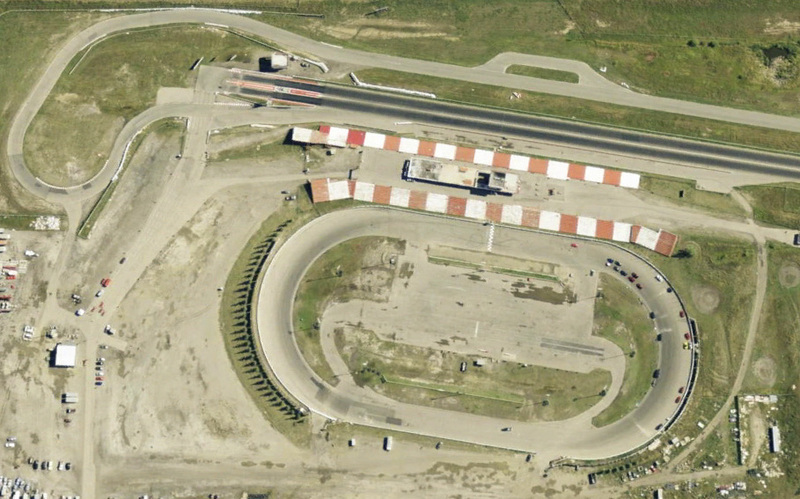 And yet, despite all the dilapidation and decay, Calgary's Race City Motorsport Park was a Mecca for the city's gearhead population. During it's 26 year operation from 1985 to 2011, Race City was the only real motorsports park for a city with a current population of over a million people. Race City featured (Hurts so much to have to use the past tense) an 11 turn 2-mile road course, quarter-mile drag strip and a half-mile oval with banking up to 15 degrees in some places. And while poor management and upkeep contributed to it's closure, it was the encroaching subdivisions that dealt the final blow. 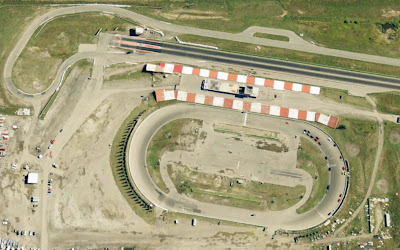 Though city council voted in 2009 to extend the lease until 2015, but the decision was later overturned and the track was officially closed on October 21st, 2011. The area will be turned into a (hopefully very pungent) landfill. When the above photos were taken, in February 2010, demolition was already well underway. The area was fenced off with barbed wire though sometimes the gates were accidentally left unlocked. This was an opportunity that reportedly got some enterprising drifters into a bit of trouble with the law. The ominous clouds seem to suit the scene well. The demolished stands are visible in this picture. Engines would roar at Race City no more. Though street racing was always present in Calgary, its popularity has exploded since the demise of the only legal race track in the city. Every Friday and Saturday night, the displaced racers meet at a small parking lot in a Calgary industrial district to talk cars and cruise. But well get to that in another installment.